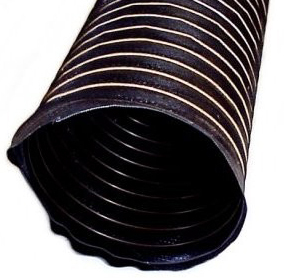 Flexible, non-kink hose directs air from front mounted ducts to spindle ducts for brake cooling. Available in 10 ft. lengths and three temperature ranges. 300Â° - 3" x10' double ply neoprene coated woven fiberglass hose with a spring steel wire inner and an external fiberglass cord support. Smooth inner wall for unrestricted flow.